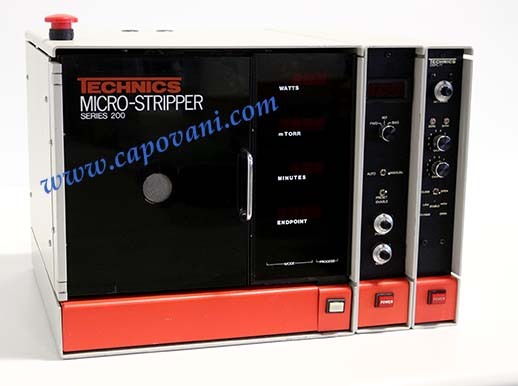 In addition to this Technics Micro Stripper -- Series 200, Capovani Brothers Inc stocks a wide range of used and refurbished plasma etching equipment including RIE, ICP and DRIE plasma etch tools. Typical manufacturers include Applied Materials, Branson/IPC, LAM Research, March Instruments, Oxford Instruments, Plasma-Therm, Surface Technology Systems, Tegal, and Trion Technology. Mechanical pump sold separately. Visit Rotary Vacuum Pumps category to select one.